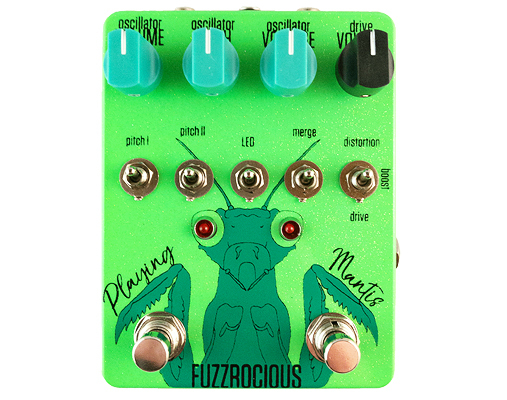 Playing Mantis is the perfect pedal for players who enjoy standing out from the crowd. 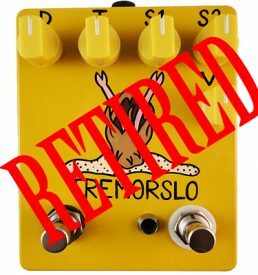 You will not sound like anyone else because this pedal is special. The right footswitch activates a natural sounding drive. Via a three-way toggle, the user can select a clean boost, overdrive, or distortion. All three settings have PLENTY of volume on tap to push other pedals or your amp/speakers. 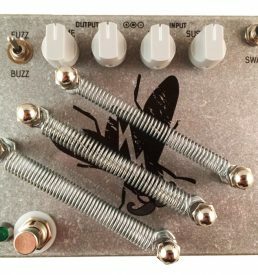 The left footswitch activates the weirdest oscillator we have made to date! The options are insane between the three pots/knobs, four toggles, and expression jack we’ve provided to help the user get weeeeeeird. 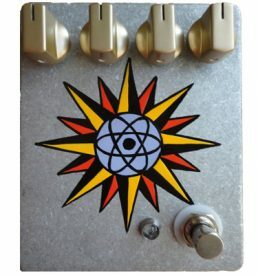 The expression jack allows you to bypass the Pitch Oscillation pot and sweep the oscillating pitch up and down with an expression pedal of your choice (we suggest a Moog or M-Audio expression pedal; others may have positive or negative effects on the sweep of the Pitch Oscillation). Two pitch toggles allow the user to mess with the pitch to move it much higher or much lower. An LED toggle adds/subtracts an LED in the oscillator to change the grit and shape. The Merge toggle folds the oscillator over and changes the shape a bit resulting in a different grind of oscillation. The volume pot controls the overall volume of the oscillator and the Voltage lets the user sag the voltage going to the oscillator, resulting in weird glitches and pitch changes. The drive and oscillator circuits can be INDEPENDENTLY activated or bypassed or used together! The first 50 units of Playing Mantis were exclusively acid etched by Handsome Beard Etching. Please note that due to the process of acid etching, no two enclosures will be exactly the same. There will be etched artifacts randomly on each enclosure and some imaging/text may be more or less crisp in appearance than others. This is part of the charm of acid etching. Now that the first 50 units have been sold, all enclosures moving forward will be powdercoated and screenprinted by JuxtaPrints.